"Shattered Sight" & "Heroes and Villains"
When I was a child, I loved fairytales. Actually, I really just loved stories. When my grandmother used to babysit me, she would put me to bed by reading one of my books aloud to me. She likes to talk, to this day, about how I had memorized those books -- how if she messed up a word or forgot a sentence, I would correct her. The fact that my parents encouraged me to read and encouraged me to be creative and tell stories is probably why I'm a writer today. In seventh grade, I took a writing class -- a benefit of attending a really small school in a really small town was that English and Writing were two separate classes -- and found myself lost in fantastic worlds. I could create characters and have them fall in love and make them angry and give them hopes and dreams. I could create lives for them that I couldn't have for myself. To this day, I'm a lover of stories for that very reason. I love creating a moment in time in which a character lives and breathes that is completely outside of my own world and my own limitations. When I was a child, I loved stories about princes and princesses; about knights and evil witches and magic and daring rescues. Nothing entrances you more, as someone who loves a good story, than to sit and pore over tales like those. But as I grew up and read more and took a lot of English classes in college, I realized something -- perfect characters are boring. Perfect characters aren't interesting. In fairytales, princesses seem perfect, right? They're gorgeous and can sing and talk to animals and cook and sew and everyone loves them except for the step-sisters or evil witches who are jealous of her beauty and youth. But as someone who reads stories now, critically, I realize how dull and flat perfect characters like that really are. Characters should be complex. Characters should be layered and nuanced. Princesses should have bad days and say the wrong thing and doubt themselves every once in a while. They should be HUMAN. And when characters in stories are portrayed as humans rather than liquids to fill a hero or villain-shaped mold, you find that they are infinitely more interesting and infinitely more relatable. I love that Once Upon A Time constantly returns to the dichotomy between heroes and villains. What I really love is that this show doesn't box characters into one label or the other. We have fluid characters, then, those who have noble motives but who mess up and those with evil intentions but are occasionally empathetic. And both "Shattered Sight" and "Heroes and Villains" (aptly titled, might I add) reminded us that not everyone in Storybrooke is easily classified as either a hero or a villain. And that's okay. So let's talk about these episodes below and discuss the end of Ingrid's story and the beginning of the tale of the Queens of Darkness, shall we? "Villains don't get happy endings." Ingrid is, perhaps, the most interesting villain to ever exist on Once Upon A Time. That is, in part, due to the fact that her very existence has everyone in Storybrooke questioning whether or not they are the heroes or the villains of their own stories and her presence in the town also causes us, as an audience, to question what constitutes a villain or a "big bad." Was Ingrid ever really a villain? While you contemplate that, let me discuss "Shattered Sight," as it was the final episode with the ice queen. In this episode, the spell has been enacted on everyone in Storybrooke, causing them to reveal the darkest parts of themselves. And if you recall throughout the entirety of this season, Ingrid has been cast as the "big bad." She's the one who blocks everyone from exiting the town. She's the one who enacts that spell of shattered sight in order to get the entire town to turn on each other so that the only ones who will remain are Emma and Elsa. But... when I stepped a bit closer to the narrative, I realized that what the show was doing was paving the way for a redemptive character -- a woman who made mistakes, realized her errors, and then made the ultimate sacrifice in order to save the people she loved. Because that is really who Ingrid was, at her core. She was a woman who just desired to be loved for who she is, instead of demeaned and dismissed because of what she could do. In the flashbacks in "Shattered Sight," we watched a younger Emma bond with Ingrid and eventually flee because Ingrid asserted that Emma had magical powers. We saw how much this broke Ingrid, how later -- in Storybrooke -- she confronted Emma again and the woman, still angry, rejected her once confidante. Ingrid then wiped Emma's memory and it was painful to watch her do so because we could see that she didn't want to, could see that it was truly hurting her to keep her distance from Emma. I said in a review for Community once that the most interesting thing about our vices is that they're often, also, our best attributes run rampant. Ambition is a great thing but when it clouds our judgement, it is dangerous. Perfectionism is wonderful when you're the leader of a project, but it makes you controlling and demanding if you let it overpower you. And love? Well, love is one of the most powerful things to ever exist in this world. But when you try and force love -- when you are so desperate for it that you begin to control people and circumstances in an attempt to earn their favor, your love becomes your vice. It becomes a bad thing. And what we saw at the end of Ingrid's journey was that she let her pain cloud her judgement. She let her own self-doubt and her own bad memories and mistakes turn her into someone she was not. Ingrid didn't think she could be loved as she was. She was convinced that in order to be loved, she had to take away everything and everyone else so that Emma and Elsa would see her clearly. Ingrid wasn't a villain, then: she was a wounded animal trying to protect the little bit of happiness and hope left within her at whatever cost it took. Emma and Elsa realize in "Shattered Sight" that the only way to break the spell is to gain back their powers (by breaking the magical ribbon bond they share with Ingrid) and killing the woman. But the problem arises when Emma and Elsa confront Ingrid and realize... neither of them are killers. 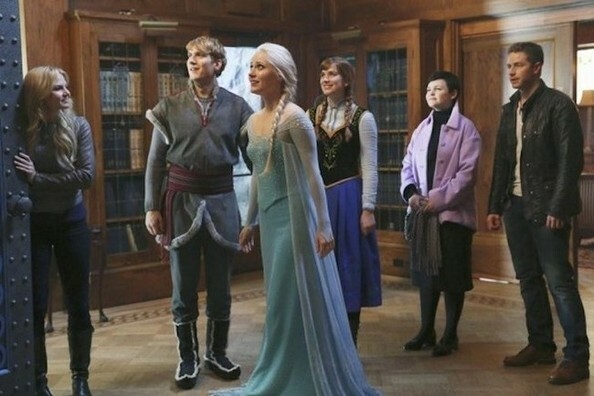 I've loved the trajectory that Once Upon A Time took with Emma and Elsa's stories. These two women are so distinct but so understandably bonded and connected by their painful memories and their pasts. But what changed both women -- and what changes Ingrid, in the end -- is forgiveness. Elsa and Emma learned to forgive themselves and forgive others. Anna, near the end of "Shattered Sight," delivers and reads a letter that washed up on the beach with her and Kristoff to Ingrid. The letter is from their mother -- Ingrid's sister, Gerda -- explaining how she regretted all that happened with Ingrid and that she regretted treating Elsa the same way. The beauty was that when Ingrid touched the seal on the letter, she recalled her sisters. She remembered her past, not as a series of pain and mistreatment as she had done throughout the majority of her life, but as memories filled with HAPPINESS and -- most importantly -- of love. Ingrid remembered Gerda and Helga as they were. She remembered how much they loved her and how much she stopped loving herself, and that while Gerda made a mistake, she regretted it. Ingrid spent her entire life convinced that her sisters turned their backs on her -- convinced that Gerda hated her and pushed her away because of the pain she caused and because of her powers. But when Ingrid read the letter and was reminded of the love those three shared, she realized something: love cannot be replaced with force. Love cannot be replaced with control. And though Ingrid tried to make Elsa and Emma love her, using bribes and schemes, the two people who had always loved her had been there all along and had never stopped. And then, Ingrid realizes what she's done. She realizes the lengths she has gone to in order to force herself to feel worthy of love and acceptance. Because the truth is that forgiveness was what Ingrid really had been after: she had to forgive herself and had to believe that Gerda forgave her for accidentally freezing Helga. And when she did -- when Ingrid realized that she had been wrong, that she hadn't needed the love of others because she already HAD sisters who accepted her and forgave her and loved her -- the ice queen decided to rectify her mistake in the only way she knew how: sacrifice. The only way to reverse the spell was to sacrifice herself to it. And it was such a beautiful, poignant moment when she did because Ingrid was finally at peace. She was finally loved. She had finally won, because she got everything she ever wanted: a family who forgave her, who cared for her in good times and bad. The beauty of Ingrid's sacrifice is in the realization (for me, at least) that she was never a villain at all. She made a heroic sacrifice not because she was necessarily a hero, but because she was a HUMAN. I don't quite know how I would typify Ingrid or compartmentalize her apart from that label. Ingrid was a flawed character who made mistakes but made them with good intentions. She wanted the thing that human beings crave most of all: acceptance. She didn't want to destroy lives simply because it was fun. She didn't desire to kill because she had been wronged. She wanted Elsa and Emma as sisters because she wanted to fill a void that was missing in her life. And when Ingrid realized that the void was never there in the first place, the sacrifice was an easy one to make because she had everything she ever wanted. Ingrid made mistakes. She made a lot of them. But at the end of "Shattered Sight," she sacrificed herself knowing that she was loved, that she was valued, and that she was forgiven. Ingrid got her happy ending. "But if you don't think villains can't get happy endings... just watch me take one." There's an overarching question that threads itself through Once Upon A Time and it's the question of whether or not happiness is something that can come to people who were once villains. Regina Mills is a prime example of this, as she's genuinely changed her heart and allowed herself to realize the goodness within her. She can never undo the past, never right the wrongs that were done to her or that she did to others. And there will still always be people who see Regina as The Evil Queen. But when the woman sits in the car with Gold during "Heroes and Villains," watching the man she loves leave her life forever to take care of his dying wife... we realize that Regina's sacrifices made her the nuanced, flawed, and yet redeemable character that she is. And because of that -- because Regina does not stop Robin and encourages him to go, because she makes the "right" decision and recognizes it as such -- she is heroic. I love that much of Once Upon A Time is spent examining the idea of heroes vs. villains. What makes a hero isn't happiness. What makes a villain isn't poor choices or selfish desires. What constitutes a hero or a villain is their HEART. Regina cannot honestly look at her life when she's sitting in that car and justify destroying someone's life in order to gain her happiness. Because, Regina realizes, that ISN'T happiness. Power isn't happiness. Control isn't happiness. Destruction isn't happiness. The Evil Queen looked at others as either obstacles or means to her happy ending and her wants/desires. Regina Mills looks at others as people -- people with their own pain and their own wants and dreams and desires for happiness, too. She looks at Robin and Marian and she sees a woman who deserves to live and to live fully, even if it costs her the love of her life in the process. Now, this doesn't mean that Regina doesn't hurt and it certainly doesn't mean she isn't angry over what happened. She mourns Robin's loss (he had to go over the town line to save Marian, whose heart still had residual frozen magic in it and could not come back from that) by tearing up the storybook page he gave her of THEIR happy ending. But when Regina sits in that car and decides not to let Marian die so she can have what she wants, I think Regina finally realizes that using other people to get what she wants will never bring her happiness. That is not what a happy ending really looks like. All it will do is blacken her heart and cause her to continue to hurt people in order to gain what she thinks is true fulfillment. Rumple was never a hero. He was a coward who preyed on others to get what he wanted. He used people -- saw them as pawns in his schemes and treated them like means to an end, rather than like people. He double- and triple-crossed members of his own family -- his own WIFE -- in order to ensure that he never had to make a sacrifice. But see, "Shattered Sight" and "Heroes and Villains" were such AMAZING examples of how utterly villainous Rumple truly is. He believes that having happiness is taking, not GIVING. Notice that Ingrid gave the ultimate sacrifice and that is why she got her happy ending. Regina, while still sad and upset, sacrificed her own happiness for the sake of someone else. That is why she is heroic and will deserve her happy ending. "Heroes and Villains" reminded us of what we have known this entire season: sacrifice always precedes a happy ending and it doesn't matter who you are or what you have done. Everyone deserves a chance at happiness, but only those whose hearts are prepared to give rather than forcefully take or control, will receive it in the end. MVPs are bestowed upon the following actresses for "Shattered Sight" and "Heroes and Villains": Elizabeth Mitchell because holy crap she did a STUNNING job portraying The Snow Queen over the course of this season. I would make a really bad pun right now but... oh, what the heck? She was absolutely chilling as a "big bad" and heartbreaking as Ingrid, who just wanted to be loved. Another MVP goes to Elizabeth Lail for Anna this season. I don't think they could have cast anyone else as the occasionally clumsy, babbling, but good-hearted sister. She was wonderful. MVP #3 goes to Georgina Haig who did fabulous work as Elsa this year. What a beautiful, honest, vulnerable portrayal we got from her. I loved seeing her evolve. The fourth MVP is to Lana Parilla who constantly brings it as Regina but who was never more stunning than at that scene in the town line during "Heroes and Villains." Brava. And finally, Emilie de Ravin displayed some of the best and most gut-wrenching acting I've ever seen on this show during her scene at the town line, earning her a spot on my list of MVPs as well. All of the tears. All of the applause to these stunning women. I wish we could have kept Elsa, Anna, and Kristoff around forever. They were seriously some of the best characters to ever exist on the show. Their story wrapped up rather nicely, though, with everyone headed home and Kristoff and Anna getting married (with one final little beautiful Elsa/Anna moment together -- "Chocolate!") Still, I could have kept this trio on my screen for the rest of the season. "You just stay here, handcuffed, where you can't hut anyone. But me. With your words." The spell of shattered sight was HILARIOUS, especially Regina being totally baffled by what she was wearing, the entire town attacking each other, and Snow/Charming verbally sparring. "I'm the savior." "Is that, like, a real job here?" So the sherbet that Ingrid hid Elsa and Emma's memories inside was carrot sherbet and EWWWW. "He's a baby, not a breakfast burrito." "Still wanna hold hands? Sing Zippa-Dee-Doo-Da?" Ginnifer Goodwin's delivery of that line was HYSTERICAL. I didn't mention it above but I was a tad disappointed at the Hook/Emma resolution. Still, I suppose a lot happened in both episodes so we didn't have a copious amount of time to spend on them talking or making up. I'm glad that Emma seemed to know that something was wrong with Hook at the diner. And Emma's shoving of Hook's heart back into his chest before he was ready was pretty great, too. "Cruella. I thought I caught a whiff of desperation and gin." "I lost my way trying to help you find yourself." Please, all of the awards to Emilie for that scene. And all of the awards to Belle for realizing how her husband manipulated and betrayed her and having the strength and courage to push him out of her life. I was so proud of her, especially when she immediately turned her back on him at the town line. "For now, let's call him... The Author." "Pretentious. I hate him already." There seem to be themes of pre-destination vs. free will this season (with the presence of The Author) and that is really heavy stuff to grapple with, even by Once Upon A Time standards.